Monday night was the 25th Annual Council of Fashion Design Awards in NYC. I arrived late as I had an earlier event with Carol Channing and company which I will write about in the near future. This event is nearly impossible for a young apprentice like me, to get credentialed for, meaning to get on the PR list, as it is controlled by Anna Wintour the Devil Wears Prada herself. Since I arrived late I thought it be best to shoot from across the street so my you could get a flavor for the overall scene. The press line is on the New York Library Steps and the celeb guest walk up the stairs posing and concentrating on their foot dress coordination, least they fall and really create an embarassment of riches for the photographers, the MONEY SHOT. The fans are kept left off center and it would be nearly impossible to get a decent shot of anyone with a face. What you don't realize is even the this set-up is a mini cat walk for arriving guests as every step of the way is planned and coordinated to help build excitement for the night and for the prying eyes of the press. With her tell tale bob of the last decade, the best friend gets out of the car on the side of traffic, as the main attraction safely exits on the sidewalk. She's carrying an cute paper bag, paper bag ugh fashion girl. It's Oprah and Gail. Here all eyes, er lenses are on Oprah as she makes her way up the staircase. (She's in the light dress, pink to be exact) It was the Oscars of fashion, where Oprah Winfrey lead an unbelievable style parade down the red carpet. “I’m wearing Ralph for Ralph by Ralph,” Oprah said of her outfit. Pale pink perfection! Lady “O” arrived to awaiting photogs who were eager to get a shot of her exquisite, floor length Ralph Lauren gown at last night’s CFDA Awards. Gail hangs back, carrying Oprah's speech in the green bag, a speech which honors the big winner of the night Ralph Lauren for his Lifetime Achievement Award. Here the lensmen wildly shoot Oprah hoping for their money shot of the day, a shot called the fashion shot. It must be taken vertically, if you notice most shots in magazines , and the cover for that matter, are vertical shots. Oprah makes her way to the TV media as the photographers strain to get a side shot. Gail steps up for her shots. As a paparazzi, one of the things you have to keep track of is what car did the celebrity that you want to shoot come in. Oprah always uses the same limo company and comes in a tinted window, sleek Mercedes-Benz. I catch the license plate and will later walk around the building to see where it is parked as to figure out which of the 6 exits she will leave from. Like a well rehearsed play, the final guest is celebrity host, Ellen Barkin, looking super hot at 53 in a skin tight sequin dress, center; Oprah on the right being interviewed as she makes through the long media greeting line on her way towards the entrance and the Gala Ralph Lauren joins Oprah near the top of the steps, pictured on right with white jacket and flash on face. This is a much more valuable shot than the one taken on the lower steps as it's the two shot, Celebrity and Designer. I then walked around the building to locate Oprah's car. A crowd had gathered, and in the end the car was "Garage'd" and no shots could be taken. I then run to another entrance and caught the departures which I will show next time. Finally the MONEY SHOT was not taken on the steps at the NYPL, no not by those guys who waited in the hot spring night for Oprah to arrive, but it was taken as Oprah was leaving her hotel, the one she always stays at as I mentioned last week. 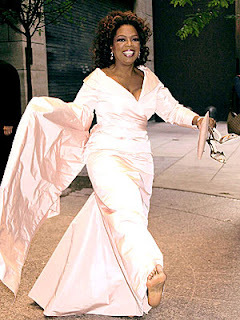 Here is Oprah leaving with her best foot forward, a barefoot. A very unique shot that was immediately snapped up by People magazine. An amazing shot. ANTHONY DIXON, the photographer, knew he nailed it and didn't need to take any others, as I did not see him at the event that night and he probably just went home and sent this shot to his agency knowing it was THE MONEY SHOT!!! Congratulations ANTHONY!! WITH THIS ENTRY MY BLOG will hit the 100,000 mark as it is currently at 99827 with this entry. THANK YOU , THANK YOU, THANK YOU for your readership. I try and continue to make my entries interesting, although I sometimes don't succeed mostly because of time constraints (I have a day job too). I will try and do a better job at "CONFESSIONS" and tell you what it is really like to get these shots, what it's like to do this type of work, the behind the scenes insanity, the celebrity secrets, the set up shots, the competition and lots of stuff that I have held back for fear of hurting people, or burning bridges. It really has been an amazing journey beginning the day I was sent to NYC on a business trip and started emailing my friends of my adventures, and then my partner telling me I should blog about it, thus begining this blog in February 2006, Confessions of a PAPARAZZI!! I remember that first red carpet event where I was just a fan like most of you, and as I was looking at Gywneth Paltrow mmaking her way up the red carpet of Proof, I said to myself, "Someday I will be in the Press Pen taking photos of celebrities, instead of straining to get a shot and getting a lot of head. How do I go about doing that? AND NOW: Monday night I did three Red Carpet events where I was in the press pen (sure I only got an hours sleep before work Tuesday, but it was a dream come true!) THANKS AGAIN FOR YOUR READERSHIP, I look forward to the next 100,000 hits. Congratulations HughE. Thanks for the funny antedotes too. Great job!! I have been reading you since the day you followed Tom Cruise around town last year. Awesome for you, congratualtions. I have been reading your blog for over a year now. You run a fantastic site.